Professionally installed spray in place foam insulation expands to fill small cracks and gaps in a building and is more effective at reducing air infiltration than standard insulation products. Because it is able to seal off more drafts wherever it is applied, spray foam insulation is able to help keep out more unwanted heat, cold, moisture, dust, noise, and pests than standard insulation. Spray Foam Coatings Ltd. uses only the highest quality spray foam insulation. 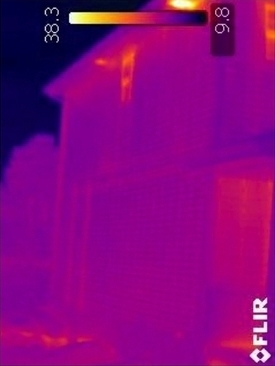 Thermal imaging provides a side-by-side comparison of exterior wall temperatures of a fiber-insulated home (right) and a foam-insulated home (left). The images, captured with the same thermal scale, show the equivalent exterior wall on two of the two-story homes. The brighter areas of the fiber-insulated home indicate higher temperatures that reveal heat is escaping from the home, which in turn translates to higher heating bills. The relatively dark, or cool, image of the foam-insulated home indicate that heat is being kept in the home, which reduces the extent of heating.